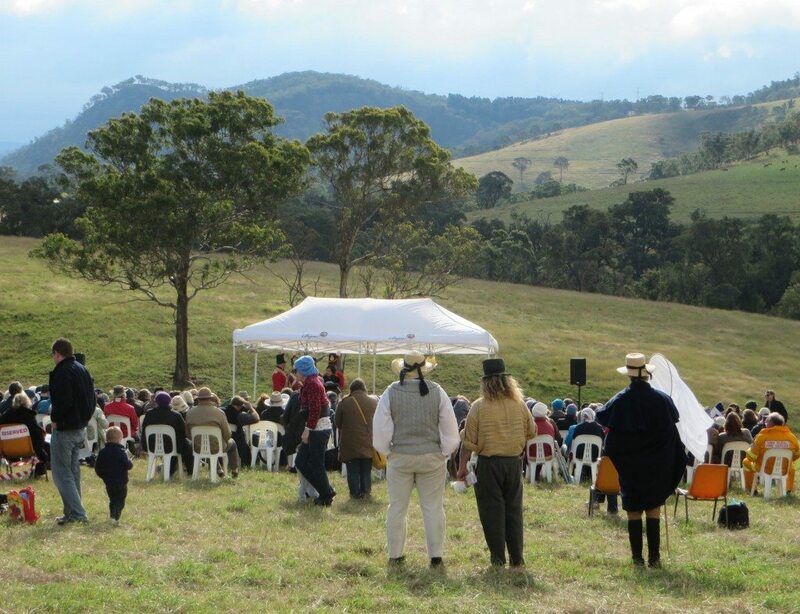 Despite concerns that followed a weather event earlier in the week Sunday’ 26th April’s historical commemoration of the 1815 arrival in Hartley of colonial Governor Lachlan Macquarie was hailed a remarkable success. The celebration in Butler’s Paddock on the caves Road marked the 200th anniversary of the expedition by the Governor and his party along the route of Cox’s Road that culminated at the site of present day Bathurst. The ceremony on Sunday reflected on Governor Macquarie and the first Christian service he held west of the Blue Mountains in 1815. In all the commemoration was a remarkable success and given added status by the presence of former NSW Governor Marie Basher. As reflected by Ramsay Moodie from the Hartley Progress Association in opening the event ‘we sit in an outstandingly historic place. Behind me you have Mt Blaxland, below us Cox’s Road and at the end of the ridge the campsite where Macquarie held the first service’. After a welcome by Mayor Maree Statham, as if pre ordained, the sun emerged from the clouds as Professor Dame Marie Bashir took the stage to deliver the inaugural Macquarie Oration. The always popular former Governor warmed the crowd of some 400 people, many of whom had travelled from Sydney. The service that followed, delivered by the Reverend Tim McIver from historic St Johns at Hartley was in itself historic, drawing on what would have been said in Macquarie’s service. Mr Moodie said that overall the day was a great success that gave a huge insight into Governor Macquarie, a man who in Dame Marie’s words committed to an ‘egalitarian regime of nation building based on merit and without regard to class’. Text from the Lithgow Mercury with thanks. Two hundred years to the day since colonial Governor Lachlan Macquarie camped and ‘went to church’ at what is now Glenroy at Hartley a ceremony was held on the site on Thursday, 30th April, to mark the bicentenary of the visit and of the first Christian church service west of the Blue Mountains. A large crowd turned out in the intermittent rain for the commemoration which included the unveiling of a plaque to mark that place in history. The Barber family owns the historic property and family members joined in the unveiling.